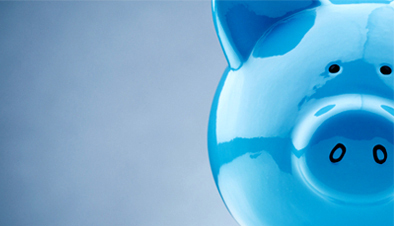 Dental Trauma, Dental Injury & accidents managed in Kingston, London. 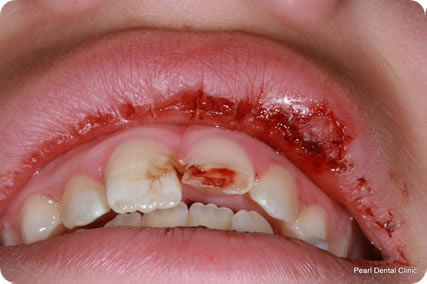 Dental Trauma involves injuries to teeth that may result in the tooth being forced out of its position (extrusion), broken (fractured) or knocked out (avulsion). 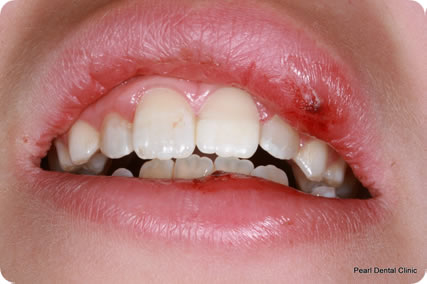 Mouth Injuries may also involve soft tissue injuries that are generally painful and have to be immediately treated by an experienced dentist. Immediately call the emergency dentist on-call by calling 0208 547 9997 as delay could result in further damage to the tooth. If a tooth is pushed inwards (intrusion) or outwards (extrusion) or is out of place, you should apply a gentle finger pressure to reposition the tooth back to its normal position. Try to avoid forcing the tooth into its socket. Use a clean moist tissue or a damp gauze to hold the tooth in its place. If a tooth has been knocked out of its socket, you should first recover it and remove any dirt or debris by washing it carefully. You should avoid touching the root surface and try to hold the tooth by its crown as you may damage the fibers on the root surface by touching the root. 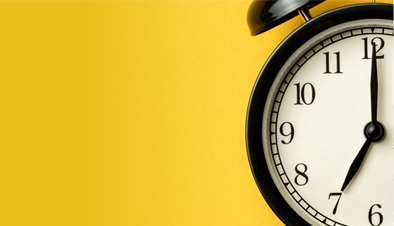 If possible, you should try to put the tooth back in its socket since it is possible to re-implant the tooth within 60 minutes of it coming out of its socket. Or you could alternatively store the tooth inside a glass of milk and immediately call the dental practice. The longer a tooth lies outside its socket, the lower the chances of a successful reattachment with its socket, so speed is of essence in such a dental emergency. 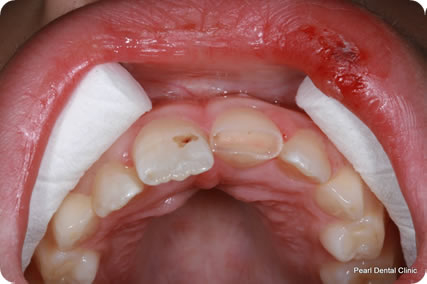 The treatment of a fractured tooth depends on the degree of damage to the tooth. But whatever the degree of damage might be, you should see a dentist as soon as possible to get the appropriate treatment. 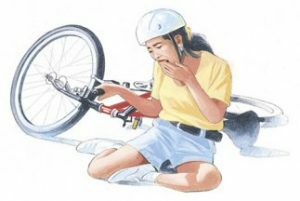 Do not worry, because a fractured tooth can in most cases be repaired. But if the tooth feels painful, try to avoid biting in that area or eating hot or cold foods in the mean time. For a minor tooth fracture, our dentists can smooth the fractured part of the tooth and minimise the injury cosmetically or do a small white filling to restore the tooth. You must take care of your tooth and try to avoid any further trauma. 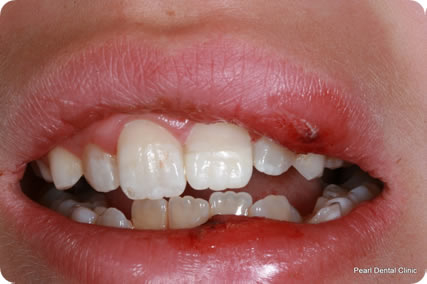 You may have a moderate tooth fracture if there is damage to your tooth enamel or dentine or both. You may need a white filling or veneer to restore the tooth back to its previous shape. A severe tooth fracture could mean that the tooth may be unrestorable. 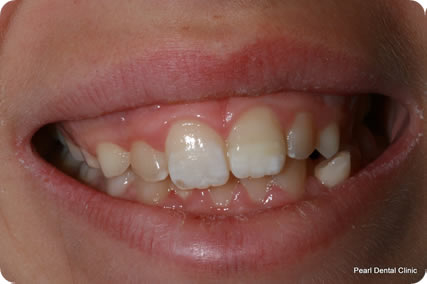 The tooth will have to be assessed immediately and if it can be saved, the tooth may need a crown. If the tooth is unrestorable, the tooth may need to be extracted and replaced with a bridge or an implant. In the event of a soft tissue injury, you need to have the wound cleaned, sutured and repaired. If there is bleeding due to a tongue laceration, then try to pull the tongue forward and use gauze to put some pressure on it. Below you can see photos of a patient who had suffered dental trauma, treated at Pearl dental clinic. 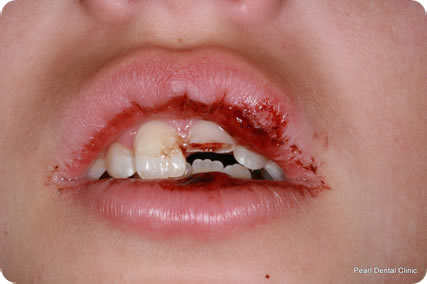 This teenager was involved in an accident which resulted in fracture of her front incisor tooth and trauma to her lips. The patient had been to A&E and been told to find an emergency dentist. We first cleaned her lips and her teeth. We then built up her incisor with composite bonding. She was happy with the end result. A week later, things looked a lot better already.